Our Solarize participants have installed solar panels on over 950 rooftops across Washington and Oregon, saving communities over $450,000 per year! Powered by Spark Northwest, this innovative group purchase program is proving that communities can come together to create resiliency and support the local solar economy through clean energy installations. Learn more about Solarize here. In the past few years, solar installations have quintupled in Washington State, and the incentives that spurred this phenomenal growth have gone overwhelmingly to early adopter homeowners. Our “Access Solar” program aims to deliver solar energy benefits for low and moderate income families. Spark Northwest is working with Seattle housing providers, lending partners, utilities, and local foundations to slice through the complexities of affordable housing finance and get solar on multifamily housing. Learn more about Solar Plus here. The Pacific Northwest has been a pioneer in developing community (or shared) solar projects with programs spanning across the region. Spark Northwest helps communities and utilities develop programs that offer renters, low income residents and other customers the opportunity to reap the benefits of solar without having to own as sytem on their roof. Learn more about this growing segement of the solar industry. Spark Northwest is building on the work of Northwest Solar Communities and supporting six jurisdictions to win SolSmart recognition for streamlined permitting, planning, codes and zoning. Learn more about the national designation program here. Spark Northwest, the WA Department of Commerce State Energy Office, and other partners have helped increase access to solar across the Pacific Northwest. Over the 2.5 year program, we quintupled the amount of solar in Washington State! 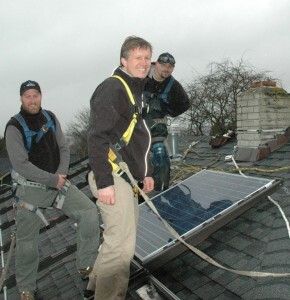 Funded by the US DOE SunShot Rooftop Solar Challenge, Northwest Solar Communities streamlined four action areas: Permitting, Interconnection, Financing, and Planning. Work groups developed tools and templates that can be easily adopted by communities to make solar easier and more cost effective for those they serve.